Though I may be obsessed with needlepoint, I have an extreme fetish for pick up trucks. Yes, another Texas icon. This manifested itself in high school when I first saw a Ford F-150. Done deal. Blackie, as I affectionately call her is my current craze, a 2011 Ford F-350. Yes, she is a female, I have never trusted a male to take me where I am going. The current in a long line of big rigs, she can haul with the best of them! Load of cattle, no problem, tractors on the flat bed, sure thing, but also just me, Karma and Bruzr (my two dog sidekicks) headed home after work. The Redhead (my husband) is my enabler. Over the years trucks have been the norm for various gift needs. 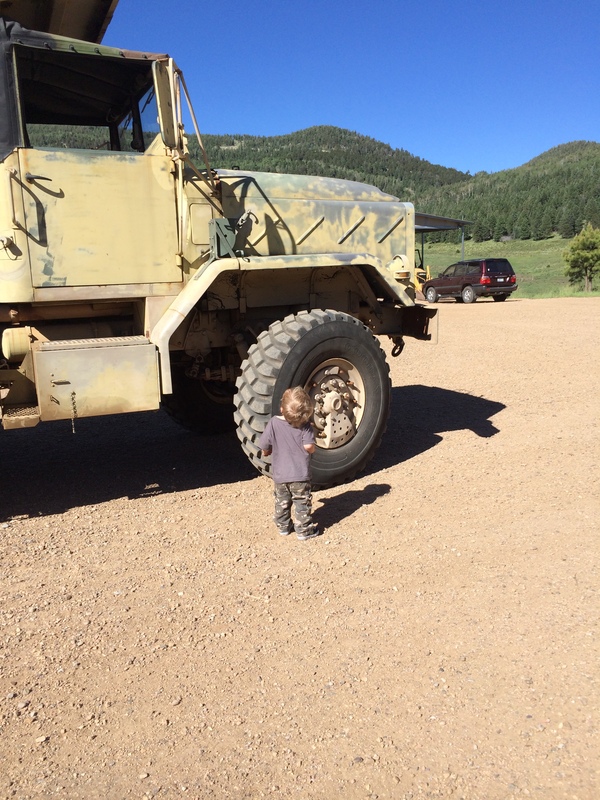 One year I received a Deuce and half, a two and half ton army truck that, in later years he dubbed too small, so now I have a 5 ton Army truck that my grandsons adore. My grandson Trace has named her “Wrecking Crew” and Davis, who is three isn’t even as tall as the tires. 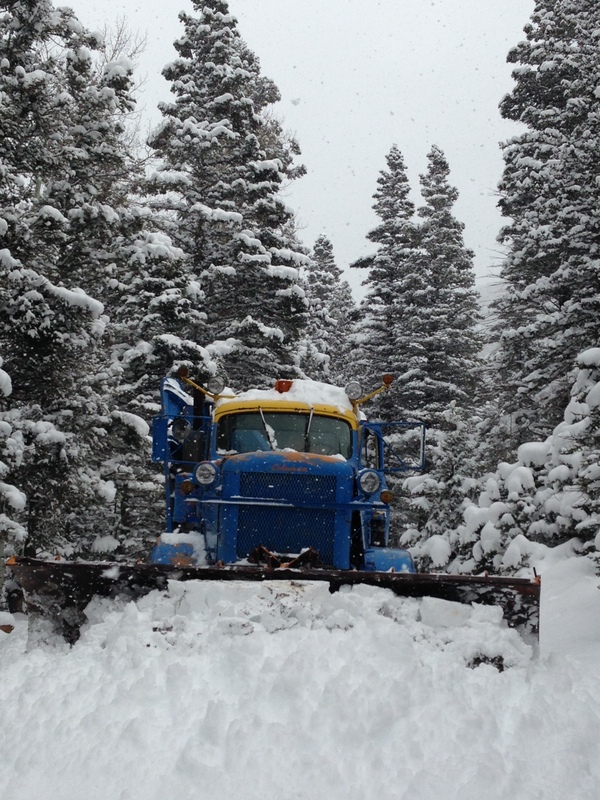 Another of my favorite rigs is a 1963 restored Power Wagon. She did a stint as the fire truck for the small town of Stonewall, Texas. Now she just carts grand kids over high mountain roads in search of various adventures. She is my avatar! See her in my profile. As you might guess Blackie is black, which is my favorite color, or as Elaine (who runs the shop) told me black is not a color, but the absence of hue. Well anyway it is still my favorite. 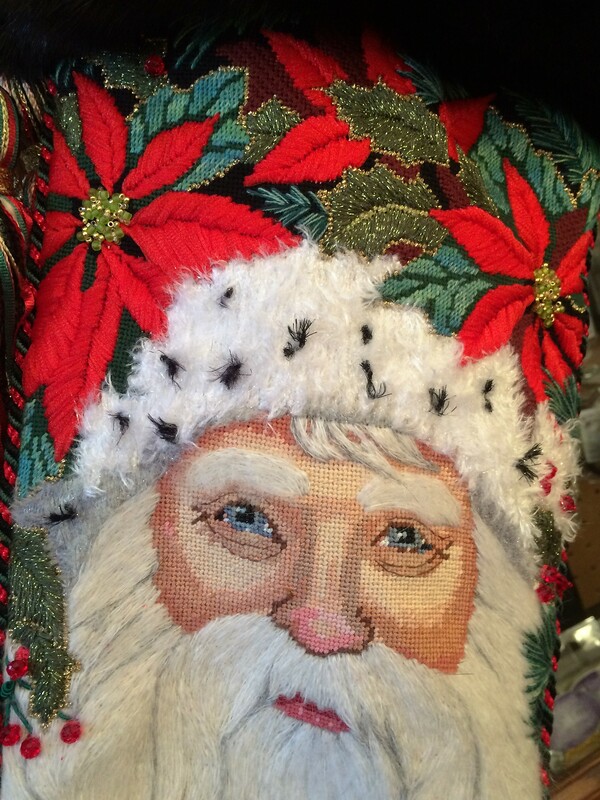 Several years ago I finally stitched a stocking for myself. It, of course has a lot of black. 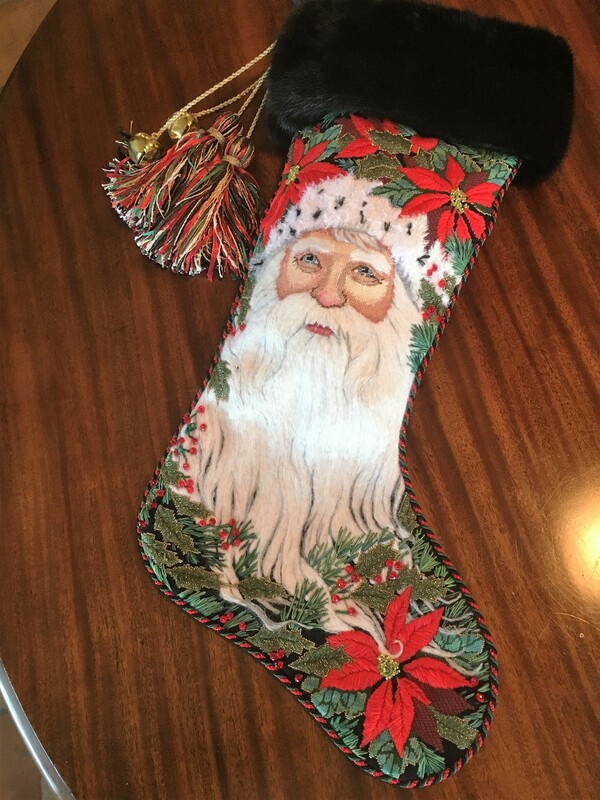 This Liz Goodrick-Dillon stocking was just so striking I had to stitch for somebody! I consider myself more of a “realist” stitcher. I love fanciful stitches, but Liz stockings just seem to scream the need for life like. 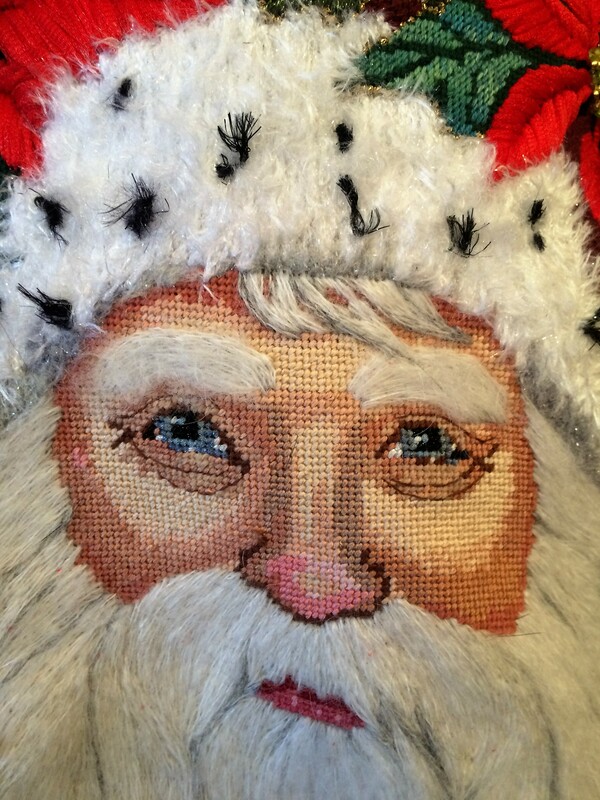 Most all of the Santa beards that I stitch in stockings are solid outline (or stem) stitch. The poinsettias were quick work in an angled satin stitch, same for the leaves and then just a few beads for the centers and the berries. I just love his beard flowing thru the pine needles. Santa with Poinsettias can be purchased by clicking here, calling 361.572.0088 or logging on to pasttimesneedlepoint.com. Texas has lots of symbols and icons… pickup trucks, lone star beer, longhorn steers and armadillos to name just a few. Believe me these are not the warm fuzzies played out in soft plush toys. I am talking about armadillos. This cast iron armored menace can lead to many late night escapades at my house. A single armadillo can totally tear a yard up in one evening. Being nocturnal they attack in the wee hours of the morning, then under the guise of looking for slugs and bugs, they can totally demolish my whole yard. This of course mainly happens when festivities are planned and after all the gardening is “done”. My ranch in South Texas is run by one amazing lady. Sherry is often my accomplice in various adventures, one of which is armadillo hunting. Lest I offend anyone who is not familiar with an armadillo, this is no easy task. Though not very smart, bearers of bad eyesight and general malaise, they are still very wily. It is true hunting. We have tried angling wooden boards from their hole into a trap. Nothing will make you madder than waking up the next morning to the boards all over the yard and everything dug up again. Poison, plugging up the homes, but… Plan B….. Sherry sets her alarm to 3 in the morning, gets her AR-15 (a lot of gun for an armadillo, but now she is mad) turn on all the lights in the yard and hunt down that little toot. Sherry is of medium stature with long blonde hair, so you need the picture in your mind of her in her nightgown and cowboy boots, toting that big gun. Gunshots at 3 am are not the norm at my house, but not unusual either. Annie Oakley of course sent that guy to better yards in the great beyond. So when Melissa Shirley’s Armadillo came into the shop that “gotta have it” fever struck again and now he will be the next project, a memorial if you will. 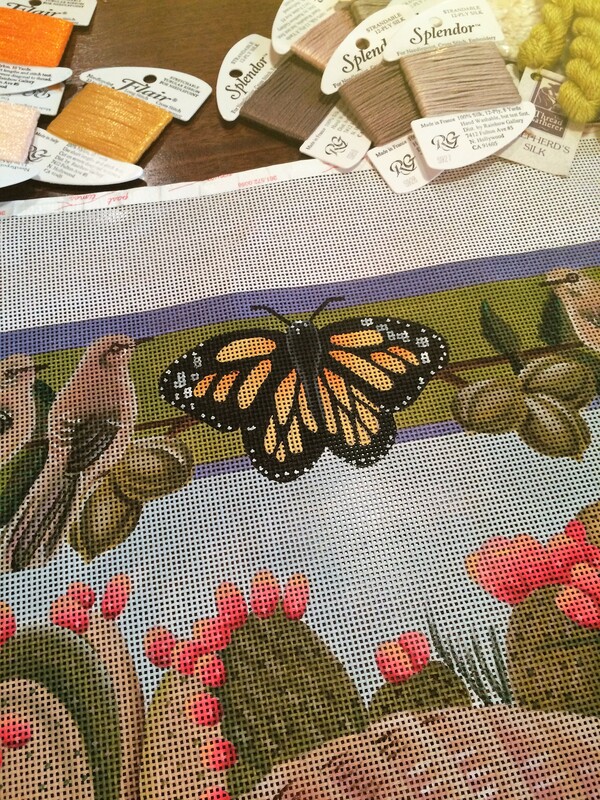 Of course full of Texas icons, I am most fascinate with the monarch ( I think I will stitch him first). We will have to make him pop! Then I think next will be that large mouth bass. Got some ideas…..we’ll see where it leads. 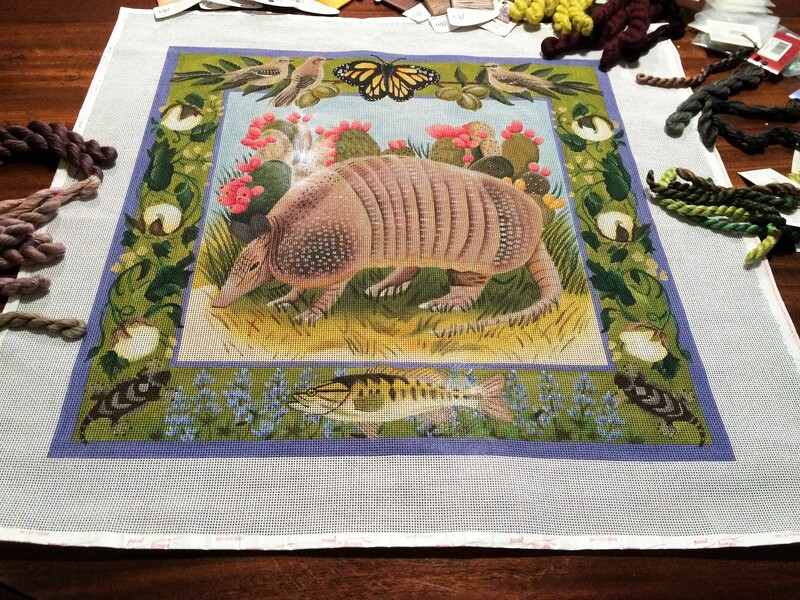 Full of pecans, horny toads, mockingbirds and bluebonnets I am thinking I can get over the armadillo. 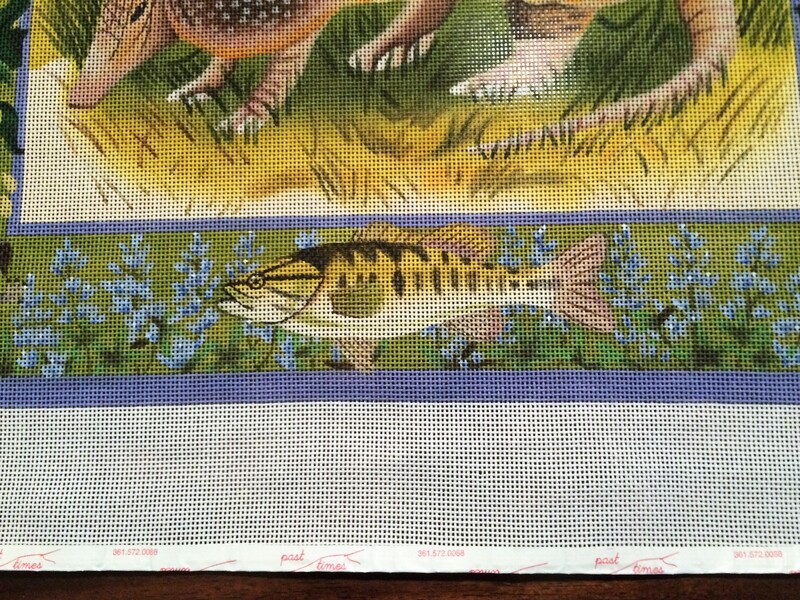 So if you want to follow along please get online to pasttimesneedlepoint.com or call 361.572.0088 or just click here. We would love to stitch along with us! (No guns please). 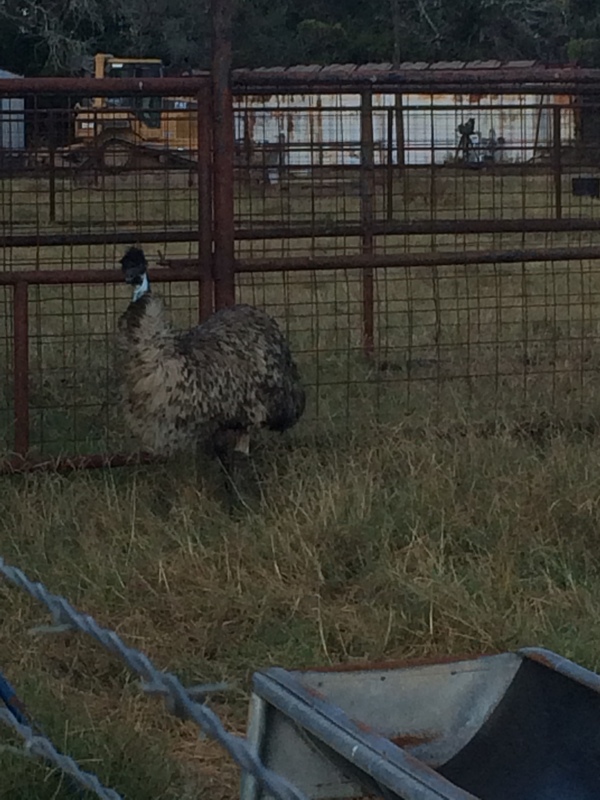 But that’s okay he is an emu. Actually I am not even sure that he is a he or a she. Anyway, one day there he was, in the back pasture just kinda hanging out with the cows. Don’t know how he got there or where he came from. Unfortunately for poor Afro, he is not very attractive, a little on the scary side and generally a ranch outcast. The cows tolerate him well enough, he eats the feed that falls out their trough and can easily side step an irritated mama cow with a calf in tow. But he and the horses….nope, not a match. I am not sure who is more frighten of who, but it is best to just not keep them together. Right now he is up in the front of the house in one of the weaning pens. He spends most of his day pacing back and forth (hence the neurosis). He looks a lot better than when he first arrived, his feathers have calmed down and the little top knot of fluff on his head (Afro) has filled out, so we think he is happy enough. Some of my friends though, have said I should give him to the zoo, but geez how would I get him there??? He is not like the cattle that you just load in a trailer and move on….. Anyway we believe God sent him to us for a reason, what reason, I don’t know….so he stays. Though not neurotic like Afro, I am obsessed. There are many times (like going to market) that I see a canvas and just have to have it. When will I find time to stitch it is irrelevant. When you own a LNS this can happen daily ( I must learn to pace myself). 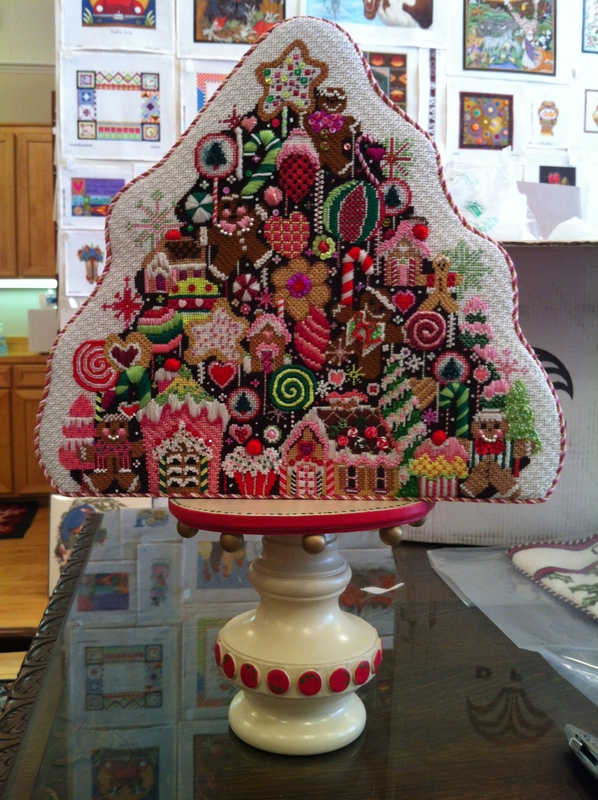 Case in point is this amazing Gingerbread Christmas Tree from Shelly Tribbey. Now my whole Christmas decorating theme (yes, of course I have a decorating theme) is based around this piece. Went to market saw it, had to have it, done. I have customers who also have this obsession, thankfully, which is why I am still in business. Like usual you can buy this great canvas by clicking here, or calling 361.572.0088! To be here is absolutely shocking me! I can’t even sleep! First and foremost I want to thank the residents gurus that made all this happen, Blythe and her husband Cale, Janet and Elaine. The rest of the cast of characters range from Bruzr, Karma and Zusha my three dogs, currently a count of about 25 momma cows and their babies, some horses, mules and one stray and very neurotic emu (that story to come), and those to come and as yet un-named. Bare with us as we move into the tech world!